Electrical stimulation units use an electrical current to simulate the same electrical impulses that are activated during normal exercise. By passively activating the muscle, the body responds in much the same way as during normal exercise. By placing a pair of electrodes on the target muscle or muscle group, the unit can send electrical impulses through the skin to underlying nerves, stimulating the contraction and relaxation of the muscle in a rhythm similar to daily exercise. 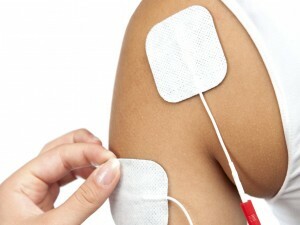 Clinically, following surgery or injury, physical therapists use electrical currents to create muscle contraction, to increase strength and prevent disuse atrophy, through nerve or muscle stimulation (electrical stimulator using high voltage, low voltage, or alternating current), stimulate sensory nerves to reduce pain (TENS), stimulate or alter the healing process of injured tissue, preventing scar tissue (interferential current, MENS, cold lasers), and drive ions beneficial to the healing process through the skin into the healing connective tissues (iontophoresis).